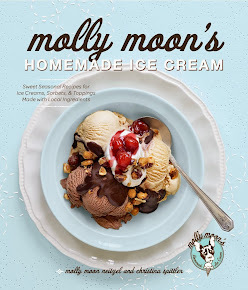 molly moon's homemade blog: sundae showdown! Our ice cream makers work hard every day of the year to churn out favorite flavors like Salted Caramel, Vegan Coconut Chunk and Balsamic Strawberry. And since they’re always tinkering and tasting and getting crazy ideas, every year we set aside some time for them to assemble the sundae of their dreams. Each shop comes up with their own concoction, and then we let you decide who will reign supreme! Each Sundae is only available in its home shop – but you can hop around and try a sundae or two (or three or four). The shop that sells the most of their sundae wins major bragging rights. In Wallingford, your two favorite meals have joined forces to create the B4D Sundae (that’s Breakfast for Dessert). It starts with a piece of waffle cone, then Salted Caramel ice cream, strawberry slices, whipped cream and maple syrup. Capitol Hill's Hangover Sundae was inspired by the neighborhood that loves to eat, drink and play. This sundae is a scoop each of Stumptown Coffee and Maple Walnut ice creams with hot fudge, Bacon Bourbon Toffee Crunch, whipped cream and a cherry. Our Capitol Hill ice cream makers even opted to make a vegetarian version of the Bourbon Toffee Crunch for, y’know, equality. Over in Madrona, our smallest shop made a sundae with big flavors. The Madrona Tree Sundae, named for the quirky sculpture that adorns Madrona school, is melted chocolate ice cream with a cherry compote, cocoa nibs, whipped cream and a piece of pistachio brittle. And our Queen Anne crew was inspired by a favorite flavor combo: honey, nuts and chocolate – just the sort of thing that a Grizzly Bear might eat. This sundae starts with Melted Chocolate ice cream, Dr. Jordan’s Hazelnut Butter, candied hazelnuts, whipped cream and spiced honey. 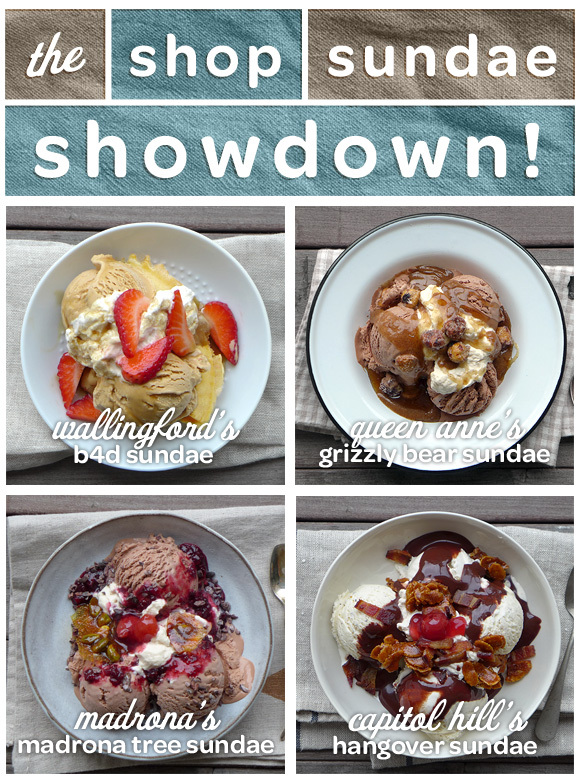 So much love went into these sundaes – may the best shop win!